The windows I'm talking about are the system administrator password request popups, the wireless network web sign-in popup, and other system request dialogs, such as "Application was downloaded from the Internet" confirmations. Often when these popups appear for me there is no focus on the input/buttons. I need to remove my hands from the keyboard and mouse over to them. I have seen one solution that involved turning on OS X's VoiceOver utility with ⌃+Option ⌥+F2,F2. 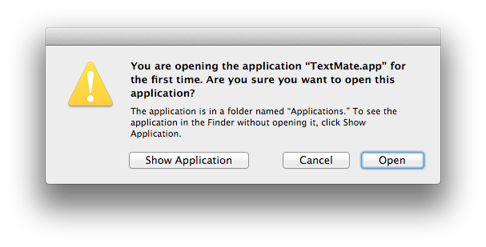 I'd prefer not to have this turned on, since in my regular work hours I use ⌃+⌥+F-keys in my IDE. I would post pictures, but my reputation isn't high enough yet. UPDATE: I do, in fact, already have the option set in System Preferences to allow keyboard navigation in all control windows. 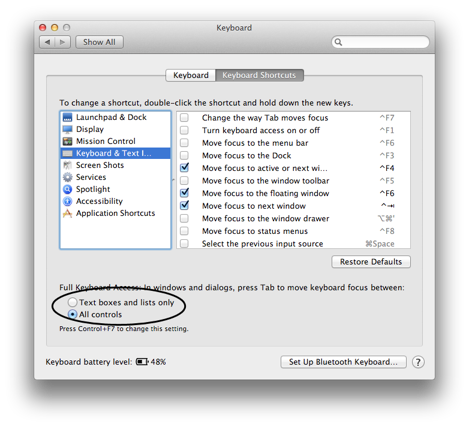 If you enable full keyboard access in System Preferences, you can press tab to select the buttons. I don't know how to focus the windows though. They can't be selected with ⌃F4 or ^F6. I was going to suggest Witch, but it doesn't show them either. Password dialogs are shown by SecurityAgent, Gatekeeper and quarantine dialogs by CoreServicesUIAgent, and the force quit window by loginwindow. Not the answer you're looking for? Browse other questions tagged lion mountain-lion keyboard . Mountain Lion Share Sheet Keyboard Shortcuts?